For better or for worse, the classic John Carpenter movie Escape From New York will soon be given the reboot treatment. Horror filmmaker Leigh Whannell has been hired to pen the screenplay, and could possibly be attached to direct as well. Details are scant about the planned project, but what's being promised is that it will pay homage to the original while still reinventing the franchise with a new vision. Given Whannell's track record, the movie seems to be fairly promising so far with the Saw and Insidious co-creator on board. As it turns out, however, there had been several attempts to continue the story established in the original movies, and the details about these projects will make fans wonder what could have been. After following up Escape from New York with Escape from L.A., Carpenter and Kurt Russell both were keen on bringing back Snake Plissken for a third movie. Determined to top the first two movies by going much bigger, the idea was to do a sequel called Escape from Earth. The plot would be set years after Snake had put an end to electricity in the second movie, essentially putting the entire planet into an apocalyptic wasteland. With no hope left of rescuing the planet, Snake looks to escape from Earth the same way he had New York and L.A. in sequels past. 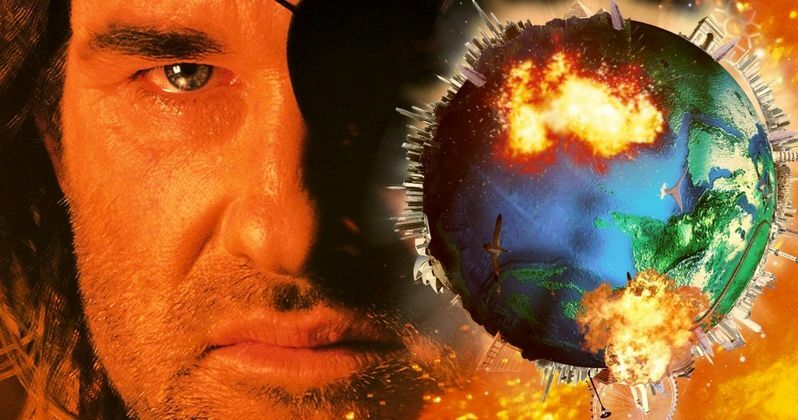 Despite Carpenter and Russell's best efforts, however, no studio wasn't willing to bite on funding the ambitious sequel, and Escape from Earth ultimately died in development hell. With the third movie dead in the water, John Carpenter and Kurt Russellthen teamed up with Debra Hill to pitch a new TV series based on the movies to various networks. The concept was to do a 100-episode series with John Carpenter, Russell, and Hill serving as executive producers, although Russell would reportedly not be reprising the role of Snake Plissken. Because the tone of the proposed show was considered too dark for early 2000s television, nobody was interested in ordering the series. It would be another missed opportunity for the Escape franchise to continue, and the plans shifted at that point to somehow keep it going in alternate mediums. One idea was to bring back Snake Plissken in an anime given the simple title of Snake. Taking place in 2020 and set across many major cities, the anime was planned to be written by Corey Mitchel and William Wilson. While the project made it far enough to have limited concept footage created, it wound up falling through like the false starts before it. Following this, a final attempt was made at continuing the series through video games, with plans to make Snake Plissken's Escape for the Playstation 2. This would end up seeing the axe prior to is release, as its developer cancelled the game deep into its development. Most likely, we will never see any of these previous ideas come to fruition. We've probably seen the end of Kurt Russell's Snake Plissken, but the franchise might ultimately live on with its new protagonist. Ultimately, we'll have to see how the upcoming reboot does in theaters, which will determine what comes next. In any case, we can always revisit Snake by watching Escape from New York and its sequel anytime we want. You can read more about the unmade sequels over at Film School Rejects.